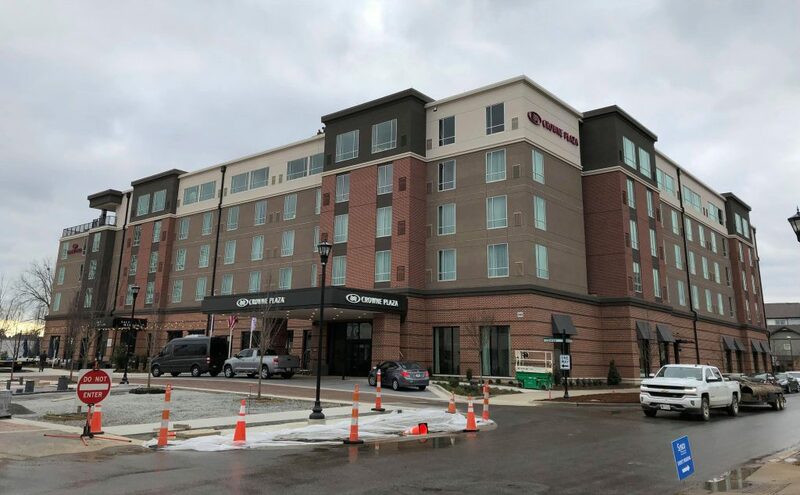 North Augusta’s long-awaited Crowne Plaza hotel at Riverside Village has officially opened its doors, giving both locals and tourists access to a high-quality center for hospitality, dining, entertainment and meeting space that is a first for the area. The hotel boasts 180 rooms (112 king rooms, 65 queen rooms and three suites), around 17,500 square feet of meeting space, a convention center, ballroom, pool, restaurant called Salt and Marrow Kitchen, neighboring Salt and Marrow Parlor Bar and a rooftop bar and terrace. The hotel opened last week and is already booked through the week, according to Jeff Brower, the hotel’s general manager. The hotel is located at 1060 Center St, at the heart of Riverside Village. Brower said the vision behind the Crowne Plaza is one that strives not only to provide excellent service and amenities to Augusta’s visitors but to be a hub for the local community. The hotel employs 85 people. The hotel combines mid-century modern design with what Brower describes as a “Garden and Gun feel,” giving off a sort of southern flare. A wide-open, minimalistic main lobby contains the sleek Salt and Marrow Parlor bar, which is sandwiched between the lobby and Salt and Marrow Kitchen. The restaurant features custom wood fired grills designed by Grillworks, and its menu is inspired by Augusta’s rich history on the Savannah River. Add to that SRP park, the brand new Ironwood Apartments, a soon-to-be-completed Southbound Smokehouse-Sweetwater 420 collaboration, and incoming retail, and Riverside Village is suddenly well on its way to being the complete entertainment hub that was originally envisioned. For more information about the Crowne Plaza Hotel, click here.